Hodge & Sons... "Unlimited quality in limited quantities"
Spring creeks offer a unique opportunity to fish light leaders and small rods. Our "Classic" model fly reels are light weight, and their simple click drag is designed specifically for these unique fisheries. Their "S" handle and classic gold & black finish make them a perfect match to any cane rod. They have a unique side-cover lock that enables the fisherman to change spools and pre-set the internal drag adjustment. 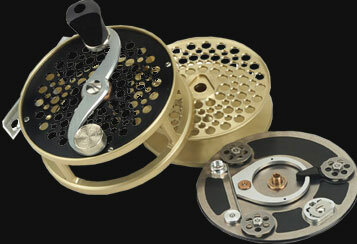 Each Classic reel is serialized and comes with an Arne Mason leather case, and a "Care & Instruction" manual. 10% Federal excise tax on all fishing tackle manufactured in the U.S. is included in the price of the reel.